Last Summer I had dreaded the school year with anxiety for the first time since I had begun Homeschooling. Not because I doubted my abilities but because I had a Toddler and an Elementary age child to teach at the same time along with a Preschooler and Kindergartener. Toddlers are intimidating creatures and I was nervous about how this was going to all work. Things were beginning to get more serious because well, I want my kids to learn in a pleasant environment. Toddlers can often make the pleasant part difficult as they begin asserting their independence! I had three to educate and one to keep from climing into the snack cabinet to munch on Cheetos at 10:30am since he tossed his Oatmeal on the floor that morning during breakfast and refused to eat. Don’t pretend you don’t know what I’m talking about! We love Little Brave with all our hearts and at home we affectionately refer to him as Little Squishy because, well toddlers are squishy and I’m pretty sure that extra layer of chub is what keeps him from injuring himself 100 times a day. Most of the Moms I asked for advice on this told me to do sensory bins or busy bags. Or train him to sit and play on a blanket. Bless their hearts but I just had a feeling those ideas weren’t going to work on my adventuresome little guy and that proved to be absolutely true. 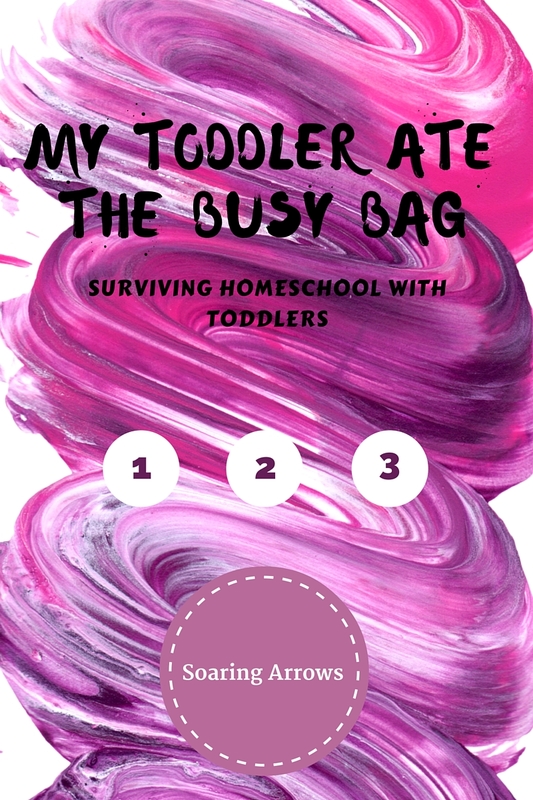 Homeschooling with a newborn was a cakewalk compared to teaching with a toddler! The bin of rice ended up with rice jammed in my carpet. The dry beans ended up in measuring cups thrown all over the house. Attempts at a busy bag were mainly just tested for food samples. He didn’t even like looking at regular, old books! I know right, just failing this Homeschool Mom thing when your toddler won’t even sit quietly to look at a book. However, halfway through the school year, something magical began to happen. My perspective changed completely and it completely changed our school year. I thought, isn’t his learning important too? Seems fairly obvious but with older ones to give attention to I was focused mainly on keeping the Toddling Guy “out of our way”. Poor thing, hopefully he leaves it out of his therapy sessions someday! So if I were to have a chat with my Mama self, starting the whole year over, these are a few of the tips I would pass along. Read alouds are going to be read while the toddler climbs on you, or is banging on a drum, or loudly playing with some cars. Number 2 diapers are going to happen the minute you start morning time. Messes are going to occur, no math manipulative is safe from the clutches of a curious little fingers. Not ABC’s and 123’s but they need to engage in play to learn and it’s usually going to be loud. Yes your older kids may need more direction but your toddler does need you to engage with them at their toddler level. Drive some toy cars on the floor, make some animal sounds, read them a story, turn on some music and dance. Toddlers are little learners too! I save the most hands on things for naptime, especially those big art projects! I save what will require the greatest concentration for naptime, the complicated math or science lesson. Anything we want to have a super pleasant atmosphere for, like Poetry Teatime, we save for naptime. Don’t be afraid to skip school all morning long, let the kids play and save everything, for naptime. There are a few baskets we pull out only during school time! This never buys me a lot of time but it will usually get me about 15 minutes which is often enough time to squeeze in one lesson. Puzzles, duplos, our car race track, puppets and lincoln logs are usually pretty safe for keeping our toddler mind busy. A short time is a long time in toddler time. Some of the best social skills are taught when our kids learn how to interact with kids both younger and older than them. So enlist some help! My littles would complain about this arrangement at first, until they realized without their help they were going to be sitting on the big yellow bus before the first snowfall. It is all part of the arrangement! You can spend the entire day in school or spend 30 minutes playing with your little brother, who is actually starting to look pretty adorable compared to an entire day of school at this point. This gives the little ones someone to play and learn with while you devote your attention to an older child, then you switch! Everyone gets a turn with Mommy. Everyone wins. Remember that it’s only one school year and not every year will be as stressful as the one with a toddler climbing on the school table during a math lesson. This is the moment you are in right now, so you might as well enjoy it! The toddler will find you. So you might as well get used to them! “Don’t be afraid to skip school all morning long, let the kids play and save everything, for naptime.” Word. “A short time is a long time in toddler time.” Oh.my.yes. “Some of the best social skills are taught when our kids learn how to interact with kids both younger and older than them.” So true and precious! “Messes are going to occur.” I keep telling my husband that when one of the kids messes something up, “Unbelieveable!” (which he says jokingly) isn’t really a realistic response. It is very believable. All too believable! Thank you so much Lynna! I am glad you enjoyed it. It’s a stressful time for sure so it’s always nice to know we are not alone!